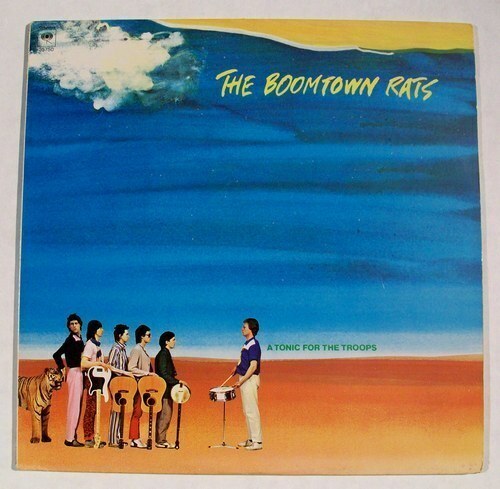 BOOMTOWN RATS ... " A Tonic For The Troops " ... Columbia JC 35750. 1979 Punk Rock LP. Stereo. Vinyl VG. Cover VG. The Boomtown Rats were an Irish punk rock band that had a series of Irish and UK hits between 1977 and 1985. They were led by vocalist Bob Geldof. All six members were originally from Dún Laoghaire, Ireland. Formed under the name "The Nightlife Thugs," the group agreed on the name change to the "Boomtown Rats" after a gang that Geldof read about in Woody Guthrie's autobiography, Bound for Glory. They became a notable band, but one whose accomplishments were overshadowed by the charity work of frontman Bob Geldof, a former journalist with the NME magazine. The group moved to London in October 1976, and became associated with the punk rock movement. ______________________________________ A Tonic for the Troops was The Boomtown Rats' second album and included the hit singles "She's So Modern", "Like Clockwork" and "Rat Trap". The album featured dark themes in an often upbeat, pop-punk style. One of the album's tracks, "(I Never Loved) Eva Braun" was described by one critic as "the happiest, cheeriest, best upbeat song about Hitler ever written." Other tracks featured subject matter including suicide ("Living in an Island") and euthanasia ("Can't Stop"). "She's So Modern" reached number 12 on the British pop charts. The album's title was taken from a line in this song: "And Charlie ain't no Nazi/ she likes to wear her leather boots/ 'cuz it's exciting for the veterans and/it's a tonic for the troops." The most commercially successful track on the album is "Rat Trap," which made it to Number 1 on the British pop charts. "Rat Trap" was the final cut on the UK version of the album and the opening cut on the US version. _________________________________________ From Wikipedia, the free encyclopedia ******* IMPORTANT ****** Please Read Vinyl Grading. When 'grading' my records for sale, I do so visually. I manage to listen to a lot of these albums, but since I sell in quantity, I simply do not have time to listen to every single side and cut on every album. I look at everything carefully, then assign a grade based on my personal observation. If something looks below par, I throw it aside and only try to sell it if it falls into a 'rare' category. Even then, I will price accordingly. I use GOLDMINE: STANDARD CATALOG OF AMERICAN RECORDS for grading guidelines. Therefore, NM (Near Mint) will not be seen unless the album is still in original shrinkwrap. Most all of the albums and covers I sell will be VERY GOOD (or) VERY GOOD. Here are Goldmine's defintions of those two classifications. Verbatim in part. VG VINYL may show some slight sign of wear, including light scuffs or very light scratches that do not affect the listening experience. Slight warps that do not affect the sound are okay. Minor signs of handling are okay, too, such as telltale marks around the center hole. There may be some very light ring wear or discoloration, but it should be barely noticeable. VG COVERS are close to their near mint counterparts. Only close. A cover may be marred by a cutout marking (cut corner, small hole punch, a cut in the spine) or promotional stamp. There may be some slight signs of handling, such as light creasing in the corners. There may be slight signs of wear at the most vulnerable areas, even a bit of ring wear. But all in all, except for a few minor imperfections, this should be a very nice copy. VG VINYL have more obvious flaws. They may lack some of the original factory gloss. Groove wear may be evident, as well as light scratches. When played, a VG record will porbably have some surface noise, especially at the beginning of a song and at the end. But the noise will not overpower the music. You may run into an audible surface scratch, but will not be a major detraction from the music. Minor writing, tape, or a sticker may detract from the label. But overall, the record will still remain a fine listening experience, just not the same as if the record was in better condition. VG COVERS have more signs of wear, such as minot seam splits, most common at the bottom center, middle of the spine, and the upper and lower right where the record is removed from the cover. These will not be overwhelming, and can be neatly repaired. Also, minor writing, tape, or stickers may detract from the cover. Visible ringwear will be more evident. There could be minor scuffing or cutout markings.Though a VG cover will still be pleasing to the eye, there's no way it could pass as new. FAIR or POOR vinyl I usually throw away, unless it's rare. FAIR or POOR covers may sometimes be sold, but only if the vinyl is still very good, and the album itself is considered collectable. I usually price this kind of quality very low. ___________ Keep these references in mind when you buy record albums, especially more 'vintage' types. Since I began selling online, all of my customers have been very happy with the records they buy from me (check my 100% feedback), so don't be afraid to bid on something you want. Look carefully at what you're buying and consider the price. I believe my prices are more than fair and quite reasonable. Rest assured, if there's any problem whatsoever upon your receiving the LP or LPs, I will do eveything possible to fix it. Powered by Turbo Lister The free listing tool. List your items fast and easy and manage your active items.